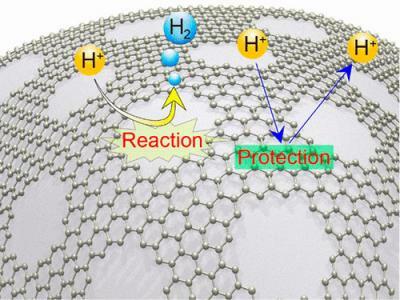 Researchers at the Japanese Tsukuba University described a graphene-based electrode that can produce hydrogen under acidic conditions. The electrolysis of water to generate hydrogen is vital for energy storage in a green economy. One of the major obstacles, however, is the high cost of noble-metal electrodes. Cheaper non-noble electrodes function well in driving the hydrogen evolution reaction (HER), but mainly in alkaline conditions, where the reaction is electricity-hungry. The more efficient acid-phase reaction requires precious metals such as platinum. Worse still, the acid electrolytes are corrosive and eat away at the core metal. The researchers have found that holey graphene offers a way around this problem. They used nitrogen-doped graphene sheets to encapsulate a nickel–molybdenum (NiMo) electrode alloy. The graphene was punched full of nanometer-size holes. The researchers showed that in acid conditions, their HER system dramatically outperforms an electrode using regular non-holey graphene. The use of graphene in HER electrodes is not new—this flexible, conductive carbon sheet is ideal for wrapping around the core metal. However, although it protects the metal against corrosion, graphene also suppresses its chemical activity. In the Tsukuba system, the holes promote the reaction in two ways, while the intact graphene part protects the metal.